How do I cool my roof space effectively? It’s a common question many homeowners ask. Keeping your home cool relies on keeping your roof space cool with a high-powered roof ventilator. The key is to ensure that the roof ventilator can do its job efficiently, with enough access to replacement air. A Solar Whiz roof ventilator can draw replacement air in through openings such as eave vents, ridge caps or any other opening into the roof space. A roof ventilator draws cooler air in through these to flush out the warmer air trapped inside the roof space. Insulation can act as a thermal barrier between ceiling & roof space, but trap heat long into the evening & night. If you’d like to see his raw data, click here! The highest temperature in the roof cavity was 42°C at 12:30PM! The chart to the left shows the temperatures recorded throughout the day. The hottest part of the day was 28°C at 2:30PM. Without enough eave vents, his unit struggled to maintain the temperature in the roof space. The data shows that without sufficient replacement air, the roof ventilator struggles to extract the heat building up in the roof. The difference between the roof space, the 2nd storey interior and the outside ambient temperature was as much as 12.8°C! The extra eave vents & ceiling vent managed to help keep the 2nd floor temperature below the outside temperature for most of the day! The hottest part of the day was 29.5°C as early as 10:30AM, with the heat persisting throughout the day. The added vents helped tremendously, bringing the temperature in the roof cavity closer to the outside ambient temperature throughout the day. 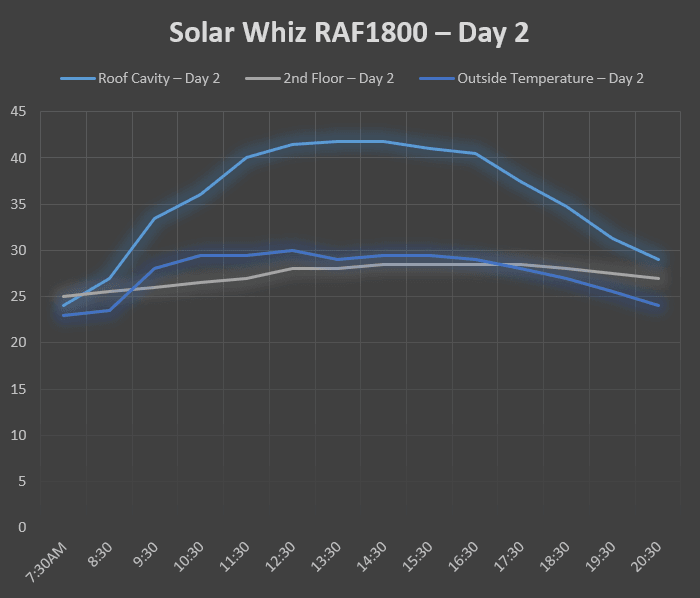 Although day 2 was warmer than day 1, the difference between the roof space, the 2nd storey interior and the outside ambient temperature decreased to a maximum of 10.8°C! 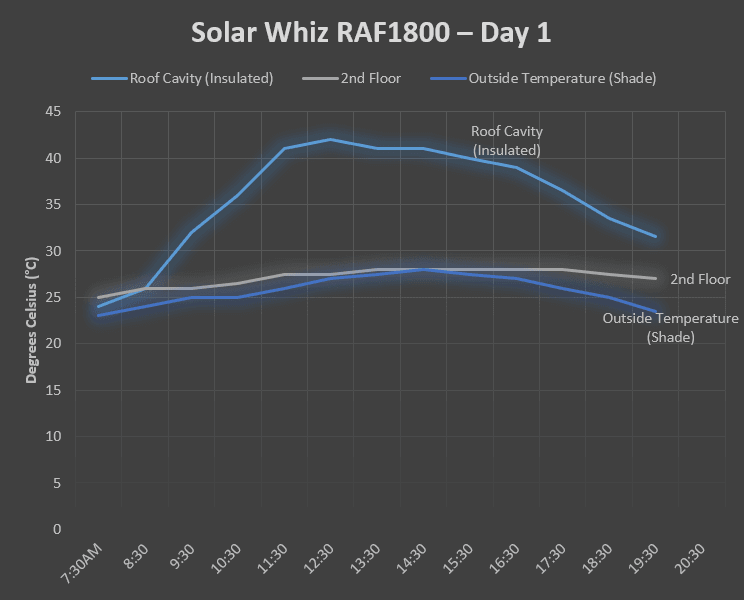 Upgrading to a 35W motor (SW-RAF2100) dropped roof temperatures to an average of 39.6°C! On the third day, Seb upgraded to an SW-RAF2100. This was hotter than previous days, reaching 32°C as early as 11:30AM and remaining above 30°C throughout the afternoon. The stronger ventilator, in conjunction with replacement air, achieved some remarkable results. The difference between the roof space, the 2nd storey interior and the outside ambient temperature averaged 6.2°C! A huge difference from Day 1. DAY 3: the 2100 has done much better at keeping the cavity from getting well above the outside temperature, with an average difference of 6.2°C. Conclusions – How did Solar Whiz perform? The chart below (and Seb’s personal conclusion) show that the overall temperature difference between the roof cavity and outside was halved. A reliable roof ventilator with access to replacement air does wonders for keeping temperatures down. Although the insulation in Seb’s roof helped slow heat transfer, the roof space remained warm well into the night past 7:00PM. This was caused by the insulation acting as a ‘heat sponge’, trapping heat inside its material. This heat will continue to radiate into your roof space after the outdoor temperature drops. Without reliable roof ventilation, this heat can eventually sink through your ceiling. Additional vents may be installed to help counter the ‘heat sponge’ effect at night. Access to a night operation kit allowed Seb’s ventilator to continue extracting heat overnight. This prevented leftover heat in the roof space and insulation from radiating through his ceiling and into his home. Access to multiple eave vents supplied further replacement air to keep internal temperatures down, even on hotter days. Solar Whiz provides a great variety of ventilators to suit your needs. Check out our products page here! 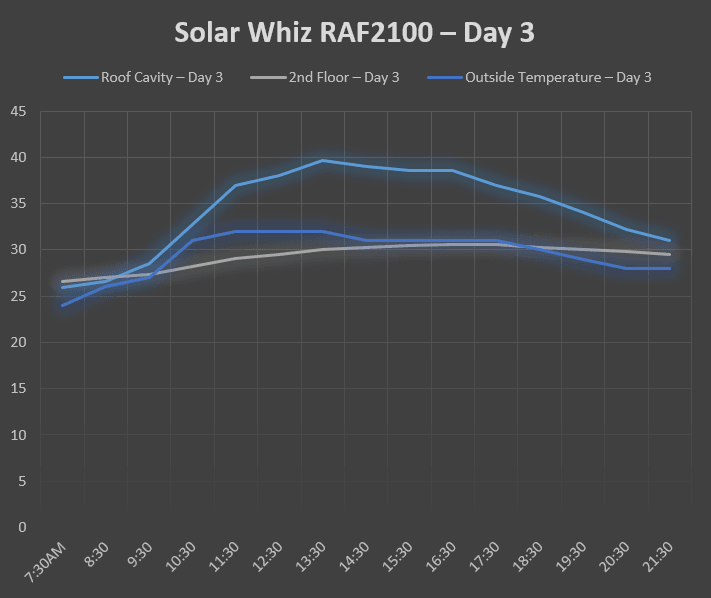 With radiance conditions being pretty similar for both days, I think we can safely conclude that the additional vents helped the Solar Whiz to keep the cavity cooler compared to outside temperatures. The 2nd floor temperatures remained similar despite hotter temperatures outside on day 2. There was a limited cooling effect inside once the roof and outside temperatures came down in the evening. 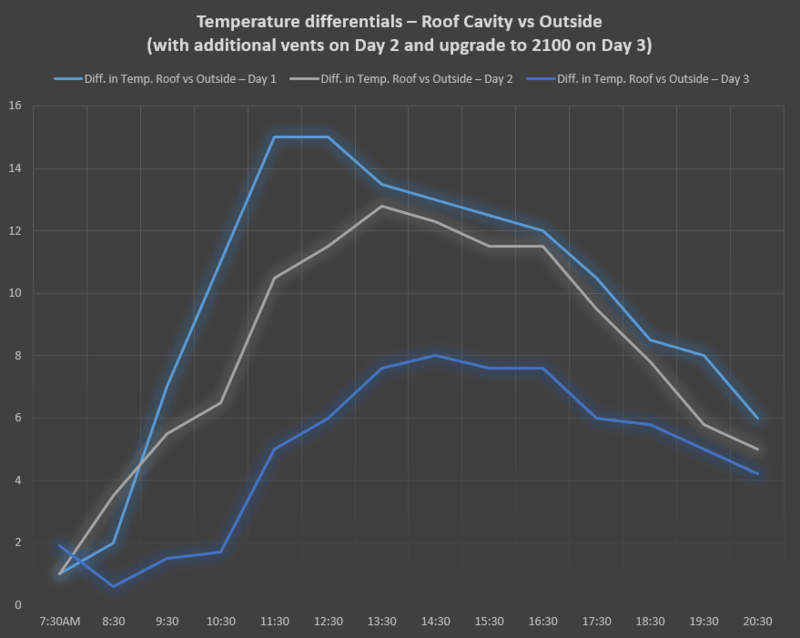 With 2100: the upgrade in the motor (from 1800) has made a big difference on the roof cavity temperatures, and a small effect on keeping the upstairs temperature lower (relative to outside ambient temperature). The average difference for the latter is only 0.3°C though, so I’ll be looking for ways to improve that, e.g. more internal vents and shutting the upstairs windows. From 10:30AM the Solar Whiz would have been drawing hotter air in through the windows. I did close them on this day, but not until the afternoon (because it makes the rooms stuffy).